The Mayor of London has urged London drivers and businesses with drivers in the capital to check whether their vehicles are compliant with the new, stricter emissions standards that will be introduced for the Ultra Low Emission Zone (ULEZ) on 8 April. Drivers of non-compliant cars, vans and motorcycles will need to pay a £12.50 daily charge (buses, coaches and lorries will have to pay a higher charge). The Mayor's office says a major awareness campaign is under way to make sure that drivers are aware of the ULEZ introduction. The ULEZ charge will be in addition to the charge levied for entry to the Congestion Charge Zone which occupies the same area of central London. The London ULEZ is the first such zone to be introduced in the World and will replace the current Toxicity Charge which has been operating since last autumn. 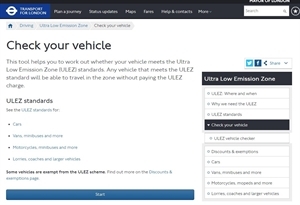 TFL’s has published an online checking tool to help drivers see if their vehicle will meet the ULEZ’s standards. The Mayor says that the introduction of the ULEZ is a central part of plans to tackle London’s toxic air and address the severe health impact of poor air quality. Other UK cities are in the process of developing plans to tackle poor air quality. Clean Air Zones (CAZ) which will charge drivers on entry (similar to London's ULEZ) are expected to be introduced in several areas. The Government is currently consulting with stakeholders to develop an on-line tool that will enable drivers to work out whether they will be charged for driving into any of the new CAZs.